Bikes Get Stolen. Seattle’s Bike Community Strikes Back. How victims of rampant theft are being reunited with their long-lost rides. 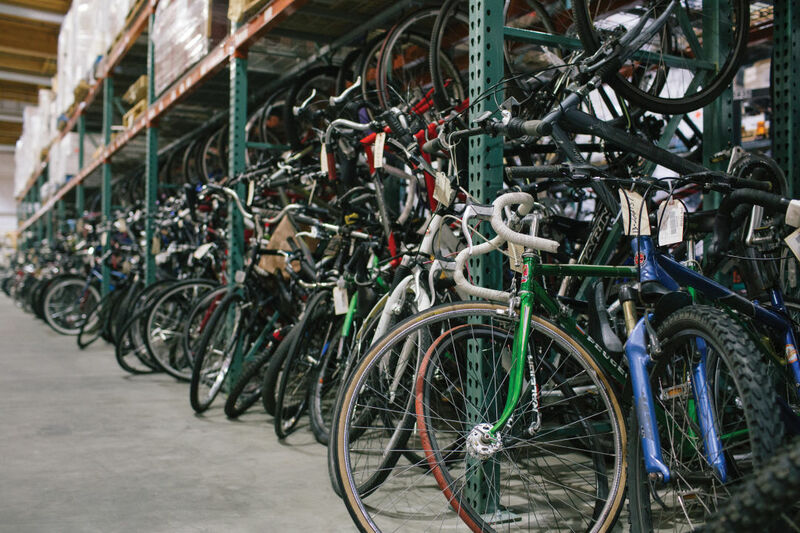 Seattle Police Department’s evidence warehouse teems with recovered bikes. SPD discourages citizens from doing their own bike-theft police work. Every theft is troubling, but the disappearance of Emily Harrenstein’s $2,000 bicycle last October kicked off an emotional roller coaster: There was guilt, there was despair, and then—thanks to the Seattle bike community—there was a euphoric reunification. The West Seattle animation professional admits to a “total brain fart” when she forgot to lock her high-end steel touring bike during a Pike Place Market improv class. She bawled when she found it missing, she says: “It’s my way of life, it’s my memories.” Blaming herself, Harrenstein posted photos of the bright blue frame on local Facebook groups; what felt like a shot in the dark jolted Seattle’s tight-knit cycling community into action. The next day, a fellow peddler idly scanned bikes parked around Ballard, at one point settling on one locked next to a tent encampment. His eye was drawn to the distinct Jones brand handlebars and a gold bird-shaped water bottle cage, and notified Harrenstein online—she only ever knew him as Dan. While Harrenstein sat at work, still more bike enthusiasts descended on Ballard to form a posse. Confidence high, they approached the tent nearest the blue bike and claimed it as their own; though the occupants denied stealing anything, they handed it over. This kind of steal-back isn’t unusual. In 2016, an anonymous Seattle man known as Bike Repo Batman achieved brief fame for spotting suspicious bike sales on Craigslist or OfferUp, then matching them to stolen rides on a Portland-born website of serial numbers called Bike Index. Batman used subtle powers of persuasion—and, reportedly, not insignificant physical size—to convince the illegal sellers to give up their plunder. Not only could a thief be dangerous, but false assumptions—about who can afford which bikes—could be offensive, even inflammatory. Bike recovery is a department priority, he says, because it’s what they call an impact crime—a felony theft that hits victims especially hard—and SPD can often reclaim stolen property listed on sale sites online. Bike Repo Batman may be the hero Seattle both needs and deserves; city bike theft peaked in 2015 with 1,570 reported stolen rides. The SPD evidence warehouse holds about 250 likely stolen bikes, so many that the department shares photos of them on a Twitter account (@GetYourBikeBack), hoping to catch the eye of original owners. Whitcomb, meanwhile, says that bicycle crime is down in Seattle 8 percent this year as of mid-July. Harrenstein’s ordeal lasted only about 18 hours, but it left her shaken. “I felt like a terrible mother, like I lost my bike baby…I wanted to cry thinking about how I let this inanimate object down,” she says, laughing a little. Raising a bike in Seattle takes a village, she learned—a village of vigilantes.